Recently, I came across this information online, that you can check your Bank verification Number (BVN) with your mobile phone, anywhere and anytime. I did it and it worked perfectly. 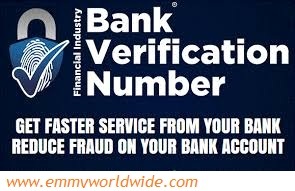 It may interest you to know that Bank Verification Number (BVN) is a CBN initiative to check fraud in the banking system by giving every customer in the Nigerian banking system a unique identification number that can be verified across all banks in Nigeria. To know your BVN, dial *565*0# on the GSM line you used in registering at the bank for the BVN registration and wait for few seconds, your BVN will appear. This is real and not a scam. Kindly pass the info to let others know. Kindly share this post with your friends and tell your friends to share it with their friends. U are welcum Dayo. Tnx for reading my post.